This site is offered to you conditioned on your acceptance without modification of the terms, conditions and notices contained herein. Your use of this site constitutes your agreement to all such terms, conditions and notices. This site is powered and operated by Energy Ogre, LLC ("Energy Ogre", "we" or "us"). You must be 18 years of age or older to use this site. Energy Ogre is a service of Energy Ogre, LLC, that, among other things, allows subscribers to locate, evaluate, and enroll in energy services through third party providers. By using the Service, you accept the terms of this Agreement. This is a legally binding agreement between you and Energy Ogre. Energy Ogre operates solely as a service provider by providing prospective buyers access to pre-screened energy offers that meet certain proprietary conditions. You are not permitted to use the Service unless you have successfully subscribed to be a member of the Service ("Member"). The Service is available to Members to assist in the purchase of energy. Additionally, optional related services may be purchased. The price and other terms remain subject to service agreements between the buying Member and the third party provider. Energy Ogre cannot guarantee the rates and/or services provided by the third party vendor. Energy Ogre is the provider of the Service and is not a party to any contract concluded pursuant to the Service. Energy Ogre is not responsible or liable to any Member, or any other user of the Service in any way, including, without limitation, any disputes arising out of the contract between Members and third party energy service providers, such as disputes related whether the parties have fully performed their obligations thereunder and any disputes related to whether a contract has been validly entered into or concluded. Each energy transaction shall be consummated directly between the member and third party provider, and Energy Ogre has no interest, as broker or otherwise, in such transaction. The materials, content, data and information provided to or made available through the Service are the property of Energy Ogre or its licensors, and are protected by U.S. copyright laws, other copyright laws, and international conventions. Except as explicitly provided for in this Agreement, you may not distribute, transmit, display, reproduce, modify, create derivative works from, or otherwise exploit any of the materials available through the Service. Energy Ogre and the names of other products and services referred to through the Service are the trademarks of Energy Ogre, LLC and their respective owners. You may not use any trademark or service mark appearing through the Service without the prior written consent of the owner of the mark. The use of the Energy Ogre site requires an Energy Ogre service subscription, and we currently offer two options: Monthly and Annual subscriptions. A separate service subscription is required for each meter. Until you cancel a subscription by notifying Energy Ogre member care at membercare@energyogre.com, it will automatically renew at the end of each subscription term at the same fee (even if you are not using the Energy Ogre portal). Monthly Energy Ogre service subscriptions may not be transferred to another meter or subscriber. Although we strive to make the Energy Ogre service available as much as possible, there may be periods of downtime (for example, for scheduled maintenance, software updates, or events outside of our reasonable control). In some cases, we offer discounted Energy Ogre service fees when you have more than one meter on the same account. Contact customer service at membercare@energyogre.com for more information. We will charge your credit card on each billing date for your Energy Ogre service subscription. You are responsible for reviewing your credit card statement for billing accuracy. Unless notified by Energy Ogre, your service subscription will automatically renew at the end of each subscription term at the same fee, and you authorize us to automatically charge the subscription fee to your credit card each billing date until you cancel your subscription 30 days prior to auto-renewal by contacting member care at membercare@energyogre.com. Subscription fees paid prior to cancellation are nonrefundable. By subscribing to the Energy Ogre service, you authorize us to charge the applicable subscription fees (and any other applicable fees, such as an early termination fee) to your credit card on file. Each charge on the applicable billing date applies to the subscription period immediately following the billing date (so a charge for a monthly subscription in January is for the Energy Ogre service in the month of February). All prices on energyogre.com are listed in U.S. Dollars. We reserve the right to increase the monthly subscription fee for Energy Ogre service subscribers paying month-to-month with no commitment, but we will notify you 30 days in advance. If you do not accept the new fees, you should terminate your subscription before the new fees go into effect. We reserve the right to suspend or terminate your subscription to the service without notice if your credit card is rejected or if your card issuer seeks the return of payments previously made to us. You agree to pay (1) any outstanding balance in full within 30 days of cancellation of your subscription, and (2) a late charge on all amounts more than 30 days past due. The late charge will be 1.5% of the past due amount or the highest rate allowed by law (whichever is less) per month. Such rights are in addition to and not in lieu of any other legal right or remedies available to Energy Ogre. IF YOU RELY ON THE SERVICE, OR ANY INFORMATION, PRODUCT OR SERVICE AVAILABLE THROUGH THE SERVICE, YOU DO SO AT YOUR OWN RISK. YOU UNDERSTAND THAT THERE MAY BE DELAYS, OMISSIONS, INTERRUPTIONS, INACCURACIES, AND/OR OTHER PROBLEMS WITH THE INFORMATION, PRODUCTS, AND SERVICES PUBLISHED ON OR PROMOTED OVER THE SERVICE. THE SERVICE AND THE WEBSITE ARE PROVIDED TO YOU "AS IS." ENERGY OGRE AND ITS AFFILIATES, AGENTS AND LICENSORS, CANNOT AND DO NOT WARRANT THE ACCURACY, COMPLETENESS, CURRENTNESS, NONINFRINGEMENT, MERCHANTABILITY OR FITNESS FOR A PARTICULAR PURPOSE OF THE INFORMATION AVAILABLE THROUGH THE SERVICE (OR ANY INFORMATION, GOODS OR SERVICES THAT ARE REFERRED TO, ADVERTISED OR PROMOTED ON, OR SOLD THROUGH THE SERVICE). NOR DOES ENERGY OGRE, ITS AFFILIATES, AGENTS AND LICENSORS GUARANTEE THAT THE SERVICE WILL BE ERROR FREE, OR CONTINUOUSLY AVAILABLE, OR THAT THE SERVICE WILL BE FREE OF VIRUSES OR OTHER HARMFUL COMPONENTS. DEALERMATCH, COX DIGITAL EXCHANGE AND ITS AFFILIATES, AGENTS OR LICENSORS WILL NOT BE LIABLE FOR ANY CLAIMS, ACTIONS OR JUDGMENTS ARISING OUT OF OR RELATED TO ANY CONTENT POSTED TO THE SERVICE BY YOU OR ANY OTHER THIRD PARTY. UNDER NO CIRCUMSTANCES WILL ENERGY OGRE OR ITS AFFILIATES, AGENTS OR LICENSORS BE LIABLE TO YOU OR ANYONE ELSE FOR ANY DAMAGES, COSTS, EXPENSES, FEES OR LIABILITIES ARISING OUT OF YOUR USE OF THE SERVICE OR ANY PRODUCT OR SERVICE LINKED TO FROM OR ADVERTISED OR PROMOTED ON THE SERVICE, INCLUDING, WITHOUT LIMITATION, DIRECT, CONSEQUENTIAL, SPECIAL, INCIDENTAL, INDIRECT, PUNITIVE, EXEMPLARY, OR OTHER DAMAGES OF ANY KIND (INCLUDING LOST REVENUES OR PROFITS, LOSS OF BUSINESS OR LOSS OF DATA), EVEN IF ENERGY OGRE IS ADVISED BEFOREHAND OF THE POSSIBILITY OF SUCH DAMAGES. BECAUSE SOME STATES/JURISDICTIONS DO NOT ALLOW THE EXCLUSION OR LIMITATION OF LIABILITY FOR CONSEQUENTIAL OR INCIDENTAL DAMAGES, SOME OF THESE LIMITATIONS MAY NOT APPLY TO YOU. IN SUCH CASES, ENERGY OGRE'S LIABILITY IS LIMITED TO THE MEMBERSHIP FEES YOU PAID DURING THE PERIOD OF YOU ENERGY SERVICES CONTRACT. YOU AGREE TO INDEMNIFY AND HOLD HARMLESS ENERGY OGRE, ITS EMPLOYEES, OWNERS, REPRESENTATIVES, AND LICENSEES AGAINST ANY AND ALL CLAIMS, OF WHATEVER NATURE, THAT ARISE OUT OF YOUR USE OF THE SERVICE. This site does not represent or imply that any service category available on this site contains a complete or comprehensive list or choice of all service providers that can provide service to you at your particular address. This site may exclude certain service providers that do not meet Energy Ogre's proprietary standards. Accordingly, there may be service providers that can provide you with service at your particular address that do not appear on this site and are not listed as a choice for you to select under a particular service category contained on this site. You are in no way obligated to use this site or to choose any particular service provider that appears on this site. 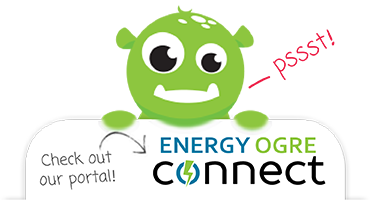 Each Member authorizes Energy Ogre to request and/or retrieve information related to your electricity usage. Energy Ogre will establish accounts, on your behalf, in order to retrieve this information when necessary. These accounts may be established with your Transmission and Distribution Service Provider ("TDSP") or with Smart Meter Texas ("SMT"). If established, your credentials will be made available to you at your request. Member agrees to abide by the SMT Terms and Conditions whenever an account is established on their behalf. Each Member agrees and understands that he or she is appointing Energy Ogre as his or her limited agent for purposes of selecting and enrolling the member's service location for electricity service with Retail Electricity providers from time to time on their behalf. BY USING THIS SITE EACH MEMBER ACKNOWLEDGES AND AGREES THAT HE OR SHE IS AUTHORIZING ENERGY OGRE TO ENROLL THE MEMBER'S SERVICE LOCATION DIRECTLY WITH RETAIL ELECTRICITY PROVIDERS ON THEIR BEHALF. In addition to enrollments for service, each member acknowledges that Energy Ogre may call a Retail Electricity Provider on their behalf, in reference to their account. Any member can rescind this authorization at any time by providing notice to us at membercare@energyogre.com. Member acknowledges that our ability to support the member services may be limited or compromised without these authorizations.